The standardization of formats and the choice of the transmission protocol are the two core components of EDI. If you do not need conversion at first, you can also limit yourself to pure EDI message exchange or data exchange, in other words: receiving and sending EDI messages. With i‑effect® this is possible through a modular structure. It is important that authenticity, traceability and security are guaranteed by means of certificates and encrypted transmission. View i‑effect® demo environment now or test it 30 days for free. To enable companies to exchange messages with their partners on IBM Power-Systems and IBM i securely and standardized (and at the same time have free choice of transmission path), i‑effect® has a modular structure and allows the use of 1-N communication modules (AS2, EMAIL, OFTP2, FTP, HTTP...). The i‑effect® incoming and outgoing documents shows all received and sent EDI messages and files of all communication modules. Companies can integrate EDI communication into their system landscape and thus have a central communication platform in B2B traffic. The communication with i‑effect® is based on a master data pool, the so-called partners. The user can define any number of clients and servers, e.g. a separate server for each AS2 partner or any number of FTP servers and FTP users. Whoever carries trademarks or orders for sister companies can define as many senders as desired with i‑effect® and then appear under different mandates. The EDIINT AS2 protocol (Applicability Statement 2) establishes a web-based bidirectional connection between AS2 server and AS2 client. EDIINT stands for Electronic Data Interchange Internet Integration. The protocol was developed to put electronic business transactions via the Internet on a secure basis; it is regarded as the entry into electronic data exchange. In AS2 communication, an EDI envelope is created for a message. Integrated security technologies (encryption and signature) make time-consuming corrections to incorrect business transactions superfluous. Message Disposition Notification (MDN) can be used to validate the desired delivery of the message and thus the correct receipt of the message. Telebox is Deutsche Telekom's classic mailbox system. EDI messages are exchanged via BusinessMail X.400, the telecom network based on the X.400 message protocol. Telebox functions as a VAN service according to the store-and-forward system: incoming and outgoing EDI messages are stored or collected in a mailbox. Users of this system can save high costs if they transfer their data via the AS2 gateway of T-Systems. EDI messages are still transmitted to the same X.400 addresses of the partners, changes on the partner side are not necessary. The trading partners can also transfer their data in the previous way without access to the AS2 gateway. Deutsche Telekom provides access to the X.400 network (and vice versa) with the AS2 gateway. Via "i-effect AS2" messages are sent to the gateway and picked up from it. Deutsche Telekom converts them to and from the X.400 network. Most people do not easily associate e-mail traffic with EDI. However, e-mail communication may also be necessary in EDI systems under certain circumstances. i‑effect® includes a B2B e-mail client for this purpose. It can be used to encrypt IFS or DB2 files, process them automatically or send notifications within the EDI workflow. The i‑effect® e-mail module is able to read e-mail mailboxes automatically and to separate the attachments. 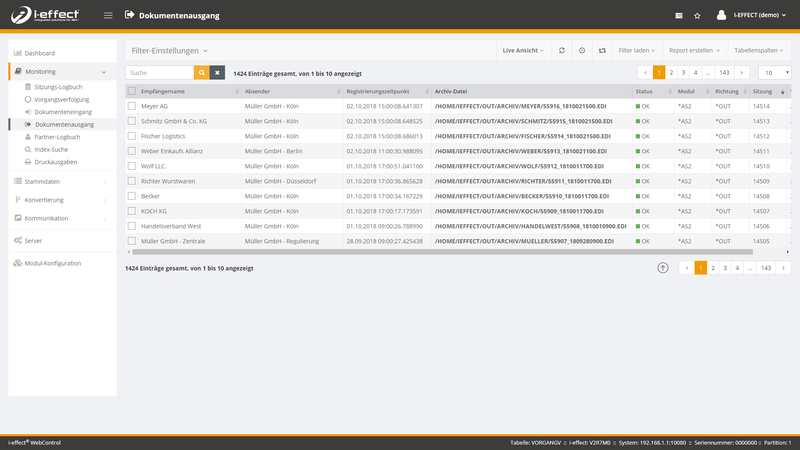 With the help of the partner management the user can send EDI messages via e-mail and access i‑effect® master data. OFTP (Odette FTP) or its successor OFTP2 is the protocol for point-to-point data exchange according to Odette standard. It was developed by ODETTE, is RFC 2204 compliant and complies with recommendation 4914/2 of the VDA. OFTP is also used in payment transaction systems between banks and companies (clearing), in the chemical industry and in the transport sector. The file transfer protocol (FTP) was one of the first file transfer methods used in TCP/IP networks and the Internet for particularly large files between different computer systems (RFC 959). FTP, which can also be used to transfer EDI data, is thus the classic procedure for point-to-point transmission. Transmitter and receiver can copy (upload/copy), download (download) and delete (delete) files to another computer/server via FTP server and FTP client. You can also create, delete and read directories. To increase security, a security standard for FTP was created according to RFC 2228 to encrypt the data channel using SSL (Secure Socket Layer) or TLS (Transport Layer Security). This security function for FTP is called FTPS. It should not be confused with SFTP. SSH is used for authentication and encryption to ensure that passwords and data are not transmitted in plain text. As a native IBM i FTP-Connector the i‑effect® module *FTP is used for data transfer between IBM Power Systems and other computer systems via TCP/IP networks. The transmission of EDI messages within different systems of a company or with EDI partners can be recorded, thus enabling complete tracking. With *FTP you can set up any number of FTP/SFTP servers and/or clients natively on IBM I including rights management. The module allows the data transfer of objects in the IBM-developed EBCDIC character set (Extended Binary Coded Decimal Interchange Code) and can be combined with other i‑effect® modules. The hypertext transfer protocol, HTTP for short, was the first method used in TCP/IP networks and the Internet for sending and receiving POST/GET data (HTTP GET, HTTP POST) between web server and browser. As a widely used method for point-to-point exchange in web communication, it is also used in EDI.